Sponsored by the Center for Peace and Global Citizenship, the growth and structure of cities major is using public art and storytelling to answer questions about confronting the past and building for the future. For Colin Fredrickson '20, being a growth and structure of cities major and history minor means tackling the tough conversations about monuments, memorials, and the relationship between public space and the individual. Fredrickson is spending his days working with Paper Monuments, an organization that combines public education and collaborative design to expand the collective understanding of the history of New Orleans, alongside fellow Haverford student Isabella Siegel ‘19 in the heat of the Big Easy. His internship, as well as Siegel’s, is supported by the Center for Peace and Global Citizenship. In addition to financial support from the College, Fredrickson credits Haverford with introducing him to the organization through a string of academic encounters during the year. For Fredrickson, working with Farber and Monument Lab helped lay the foundation for orchestrating conversations about the relationship between art, cities, and history that he looks forward to applying with Paper Monuments. 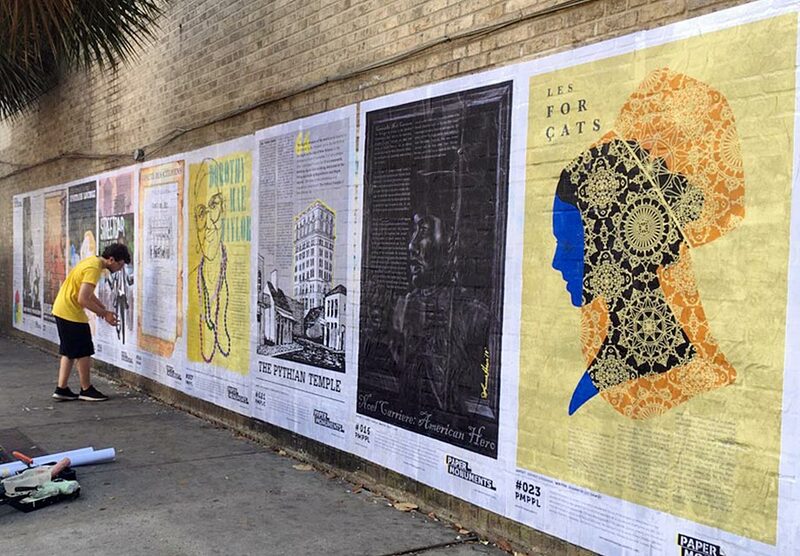 As an intern with Paper Monuments, Fredrickson assists with the planning and execution of different poster installations around the city, which has been the organization’s signature project since its founding in July 2017. While his focus is on these installations, Fredrickson also has a hand in many of Paper Monuments’ other endeavors, including working with the production team on their newspaper (The Paper Trail) and participating in weekly meetings about the long-term goals of the organization. Fredrickson’s time with Paper Monuments has encouraged him to continue pursuing these conversations when he returns to Haverford in the fall to begin his junior year. One thing Fredrickson does know for sure: it is easy for anyone interested in history and cities to get involved and participate in this type of work.